Geothermal is the natural heat of the Earth. The temperature at the Earth’s centre is estimated to be 5,500oC – almost as hot as the surface of the Sun. This heat is derived from the original formation of the planet and from the decay of the radioactive elements in the Earth’s crust. It is transferred to the subsurface by conduction and convection. For centuries, geothermal springs have been used for bathing, heating and cooking. But only in the early 20th century did people start to consider the heat from inside the Earth as a practical source of energy with huge potential. 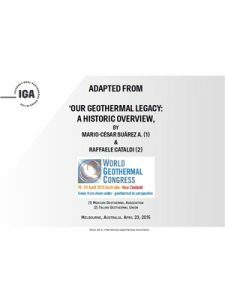 Geothermal energy is now used to produce electricity, to heat and cool buildings as well as for other industrial purposes like grain and lumber drying, pulp and paper processing, fruit and vegetable cultivation, soil warming and many others. The exploitable geothermal resources are found throughout the world and are utilized nowadays in 83 countries. Only a small fraction of geothermal has been used so far and there is enough room for development in both electricity generation and direct use applications. Geothermal represents a promising energy source to satisfy the growing energy needs. 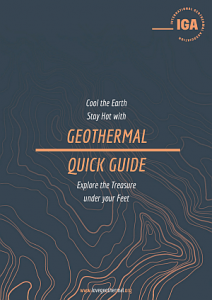 Download the IGA ‘Geothermal Quick guide’ Brochure (pdf, 4 MB) to find out more about geothermal. By the end of the 19th Century, Prince Piero Conti conceived the idea to harness the natural steam of the Larderello geothermal field in Italy to produce electric energy. He started to develop technical experiments and tests in 1903, and a year later, the first geothermal-electric energy was produced and used to light five lamps of 5-watts. In 1913, Conti put in commercial operation a power plant of 250 kW fed by pure steam, and in 1916 two power units of 3.5 MW each. This is how geothermal power production was born. It is a beautiful renewable energy source, supplying Iceland with close to 70% of its needs for primary energy. Through its variations in nature, it can combine beauty, wonders and great practical benefits. Geothermal energy is a base-load, low cost, environmentally clean, and indigenous source of energy for all countries of the world. In particular, geothermal energy has potential to contribute to the development of remote areas. For me is simple, it is clear that Geothermal is clean, sustainable and a reliable energy. So, this is one of the best renewable energy to reduce the CO2 Emissions. Share your opinion about geothermal with us!